A huge amount of people on s3 (and I assume s1) received this message today because of an invasion glitch that lasted around 3 hours. If the game is broken, that is your fault, not ours. If we had not taken advantage, we would’ve fallen behind those who did (which was almost everyone who was online). Roll back the server if you have to. Compensate those who didn’t get the bonus if you have to. Take the illegitimate bonus away if you have to (though why anyone would request this, as suggested in the message, is beyond me). But don’t blame the players for taking advantage of your coding error, when so often those errors work against us. Besides - what did we really gain, really? A better chance to promote to the next Invasion league? That’s literally it. Everything else is immaterial. It was fun for a while, but really we haven’t gained much for it. Please test your game before releasing and this wouldn’t happen. Or perhaps, next time there’s a glitch that takes rather than gives, we’ll all send equally snotty messages your way. Post written on behalf of my 13yr old that plays, who enjoyed messing around in invasion with the extra boosts, and was extremely distressed and upset when seeing this message pop up in his mailbox. Also, not to mention that the very reason s1 and s3 have invasion in the first place is to try it out and supposedly iron out any bugs and balancing issues. The fact that we are not getting a finished product should make redundant any grounds for that terrible message. Agree how are people to know a free item is one time only and not a give away. Yes it IS pathetic. And the end of that message?! No one is going out of their way to bother customer support to remove the power ups. Especially since the invasion is almost over anyway. And they still haven’t appropriately compensated the sticker issue that happened a couple of weeks ago (give us the stickers or give us the diamonds to buy it). That being said, don’t care, let sleeping dogs lie. This must be all of your first go around with video games if you didn’t know taking advantage of something like this IS grounds for banning, and you would never win in a lawsuit against PB. Yes I’m on S3. Yes I also got free powerups. Yes I did message support and they’ll tell you this was simply a warning and there will be no further action unless it happens again. Also, this is our 3rd invasion. Are you honestly going to have the audacity to say you “didn’t know” this wasn’t really free? We always only get 2 free powerups per day. Every single person who got more than 2 free powerups today knew exactly what they we’re doing. I agree with @Mermaid_Alice everyone knew what they were in for when they collected the power ups. I think the fact that you attempted to do it was what gave them reason to send you the warning. To clarify I wasn’t trying to do it. I kept doing it because I was attempting to collect my initial freebie which I was never able to collect. I was unaware of the glitch until I received the extremely rude message. I’m sorry but I don’t see anything disgusting or rude about PBs warning. If you didn’t know about the glitch and couldn’t get your main freebie then sorry, but everyone else knew and this spread like wildfire throughout vip, global and guild chats. There’s no way a majority of playerbase who abused this glitch didn’t know about it. And honestly, if this had only been a handful of people, PB would not have bothered to send out this warning. That’s what makes it not rude. A vast amount of players collected large amounts of these powerups. And they issued warnings vs basically shutting down the entire Server. The consequences here could have been 1000% worse. 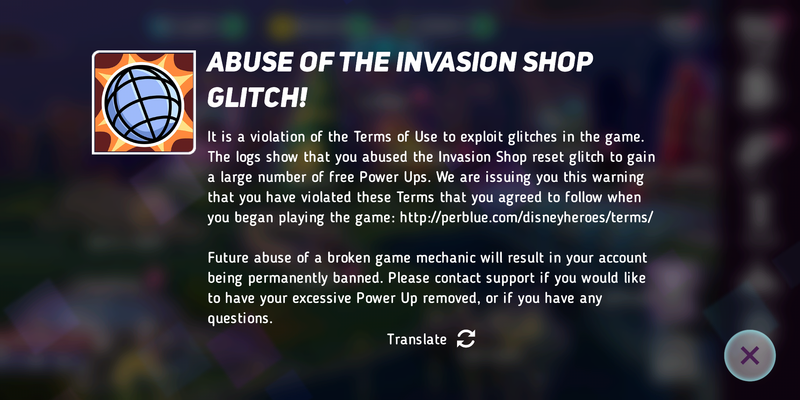 For anyone else who actually did mean to abuse this and is still feeling distraught after receiving this warning, get off your high horse and be glad that you got to keep your extra powerups. You broke the rules just like everyone else on servers 1 and 3, and you knew very well you were doing it. Also how are players meant to know if it is a glitch or an intentional feature from Perblue. It’s a glitch when something out of the ordinary happens with out prior notification from the developers. I’ll admit I availed the power ups, yes I abused the glitch, am I mad they sent a warning?.. No!! I appreciate it, it just proves that the developers are actively invested and care about their game. Do I know for certain? Let’s not forget that they said they were planning to make tweaks to the invasion format. How can I know, for certain, this isn’t one of those tweaks? Welcome to the Disney Heroes: Battle Mode 1.8.2-A Update! This release features a number of Invasion improvements and fixes for servers 1 and 3! We’ve received a lot of good feedback from players on servers 1 and 3. In general, feedback is positive: people enjoy playing the battles, working with their guilds and receiving the rewards. These changes will be implemented with a server update on Monday morning, April 8, and will be active during the invasion that starts that day.